Just a few weeks ago, I was in a truly special place physically—undoubtedly the best shape of my life—finely tuned, conditioned and prepared to attack my first full marathon. I was strong and sturdy, focused and confident. Six months ago, I set out to run the Dallas Marathon. It wasn’t an end goal; it was a beginning. I’d run Dallas in December, Oklahoma City in April, then New York City next November and Houston two months after that. My aspirations are never modest in size or scope. I did the requisite research and established a training program that I thought would best prepare me for the race—a means to an end. What I learned along the way is that training is the race, for most intents and purposes. The event, itself, is really just a celebration of the preparation. From mid-summer through the end of fall, I routinely logged my morning miles before the sun showed up. I set early alarms on Saturdays so I could fit my long runs in front of a day’s worth of college football. My friends—who eventually got used to receiving 5 a.m. text messages—thought I was nuts; their reactions were almost always a combination of marvel and disgust. As we get older, the available avenues for pushing our physical limitations dwindle. But endurance sports provide an environment for continued competition, with the clock serving as a constant, indomitable opponent. That being said, I started running to offset my affinity for pizza and beer—and unwittingly rediscovered my inner athlete in the process. Kolby Paxton is the running editor of ACTIVE.com and—you guessed it—an avid runner. Arguably the least impressive football player to play stand on the sideline at the University of Oklahoma, Paxton eventually graduated from a directional school you’ve never heard of in a town you’ve never heard of before the Associated Press named him Oklahoma’s Best New Journalist—while working at a paper you’ve never heard of. 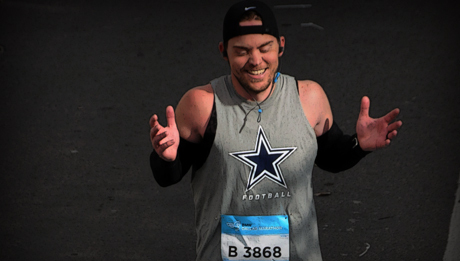 After earning a master’s degree he’ll never use from the University of Missouri-Kansas City, Paxton and his wife relocated to Dallas, Texas, where he would become the self-proclaimed voice of the common runner. In his free time, Paxton enjoys hanging with his beagle, cheering for the Rangers, and yelling at the Cowboys. Follow Kolby on Twitter or Instagram.